If you have never played a 1-day fantasy soccer contest online for the EPL (English Premier League), now is the time to prove your skills! This Wednesday, January 31, 2018 DraftKings.com is offering a $20,000 English Premier League Fantasy Soccer Contest for Gameweek 25 midweek fixtures known as the $20K Striker which is FREE with any deposit (min $5). The deadline to fill out your lineup is 2:45pm EST. See lineup details below. To play, simply set your roster here and wait for the games to start to cheer on your players! Join DraftKings right now and get a free contest entry just for making any first deposit ($5 minimum)! DraftKings is giving away $20K this Wednesday for their EPL Fantasy Soccer Contest. 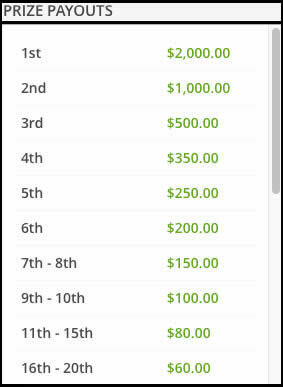 The top 1915 entrants get paid with $2000 for 1st place! Simply choose 8 players (2 forwards, 2 midfielders, 2 defenders, 1 goalkeeper and a utility player that is not a goalkeeper) to create your roster. See screenshot below for an example of lineup structure. Looking for some longshot picks to take down the contest? Here is a list of this week's sleeper players or cinderella picks as they call them. These underdogs should give some of the superstars a run for their money in this week's English Premier League games. - Alexis Sanchez (Man United) - $8800 - Here you are going to get many shots on goal from the dynamic Chilean mid-fielder - exactly what you want in Fantasy English Premier League. He scored a whopping 32.8 fantasy points on 12/28/2017 and averages over 13 points per match. - Marcos Alonso (Chelsea) - $6300 - His form over the past month makes him a must have in your Fantasy Premier League lineup. See the Shropshire Star for more details. Scored 19.3 points against Arsenal on 01/03/2018 and averages 11 fantasy points per match. - Riyad Mahrez (Leicester) - $9400 - He is back in form and can be dressed as either a forward or a midfielder making him very valuable when creating multiple lineups at DraftKings. Everton has allowed the 2nd most shots to attacking midfielders this season making Mahrez a very attractive play. - James Tarkowski (Burnley) - $2900 - The very low cost here but consistent fantasy points makes the defender a great darkhorse pick if you are willing to take a player from Burnley. A nice way to fill out your roster cheaply. Look no further - You have found the Best EPL FANTASY Contest on the web! Visit DraftKings.com now to get a free contest entry! Disclaimer: DraftKings nor RealMoneyFantasyLeagues have any association with the EPL or any other Soccer / Football league with respect to the outcomes of games/matches, etc... Fantasy contests are for entertainment purposes only. Check your local gaming laws for regulations regarding fantasy sports contests. Picks listed above are opinions only and are not guaranteed in any way to be successful or guaranteed to help to win cash or prizes. Play responsibly.